The Diocese of Brentwood held its annual Head teachers conference in October with Rainbows Bereavement Support being represented both days by Derek Kelly, Registered Director for training. Derek met with both the head teachers of Rainbows Schools in the Diocese and also attracted numerous enquiries from schools who have not as yet been trained. 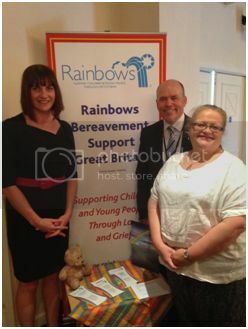 One such enquiry has already completed its training with Rainbows being used in the school and others are in the process. The heads of existing Rainbows schools have become very eager promoters of the benefits of Rainbows amongst their peers. The conference opening guest speaker, Michael Holman SJ, Principal of Heythrop College (pictured below) recognised the importance the work of Rainbows and in his speech regarding the Year of Mercy specifically mentioned the benefits of timely interventions in case of bereavement of which Rainbows Bereavement Support is an important agent.